Long after the final whistle had sounded and the league cup was in their possession, the Mayo players were still making their way around to pockets of their loyal support in every corner of the ground who had waited to live and breath the moment. Only the league? It didn't feel like it just then. A campaign that saw them lose the two games they perhaps wanted to win most - Dublin in Croke Park and Galway in Castlebar - ended with the intoxication of some long overdue silverware, a 12th league title. Rather than glumly raise it to the sky and discount it as something that would be soon forgotten as the focus switched to championship, the players chose to embrace it for what it was: a national title won in Croke Park, something that eluded them on the previous 10 occasions they've been in the same situation (three league finals and seven All-Ireland finals including the 2016 replay) since their last league win in 2001. Cynics may view the celebration and suggest a bit of perspective. But these are no ordinary circumstances. The pain of so much defeat gave Mayo a credit line for a spot of indulgence. It was easy to understand. They'll have been buoyed by the manner of their victory too. Four points down at half-time, they won it by four and left a lot of scores out there, with eight wides plus 11 shots that dropped short or hit an upright. Kerry were reminded that physical inferiority not only manifests on wet nights in Tralee but also on drier, crisp days in Croke Park. That element will come with age but for now, this defeat leaves many questions about what constitutes their best team. They've now gone five games in Croke Park without a win, and this was the fifth consecutive game here in which they had failed to beat Mayo. Mayo plundered three second-half goals and could well have had more: Shane Ryan blocked James Carr's shot, after Aidan O'Shea's sublime pass, and Carr had claims for a penalty. Mayo's goal rush exposed lingering defensive deficiencies that hadn't been as evident up to now and undid Kerry's productive work in the opening half when backed by the wind. They were tight and largely disciplined in repelling Mayo attackers early on. The trouble was Kerry didn't make enough of the wind advantage at the other end and a 2-3 to 0-5 interval lead left them in a precarious position. 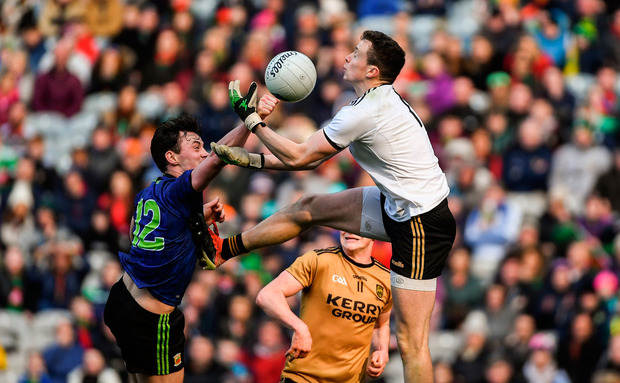 Mayo's physical force put the squeeze on Kerry in the second half, forcing turnovers that hemmed them into their own half for long spells. 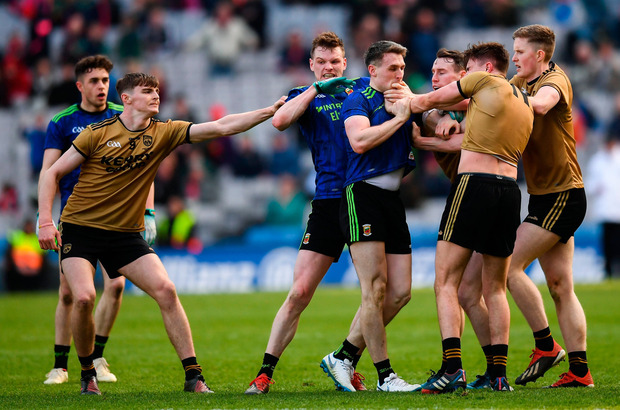 Kerry may have grievance over the manner in which Lee Keegan sought to suppress Sean O'Shea - the Mayo centre-back was yellow-carded in the 41st minute - but their league talisman still didn't make the impact on the game they required, doing his best work tracking back. Overall it was a feisty affair with 12 yellow cards (seven for Mayo) and two red, Mayo's Aidan O'Shea and Kerry's Diarmuid O'Connor sent off for double yellows late on. Stephen O'Brien was arguably Kerry's most productive attacker, splitting the Mayo defence for a 25th-minute goal. David Clifford chipped in with an assist for Gavin Crowley's goal earlier in the half, plus two points, and as the summer progresses his influence will grow. But this Kerry team, given its age profile, lacked the required leadership to dig them out of trouble when the pressure came on. In contrast, Mayo had leaders in every line, no one more so than their captain Diarmuid O'Connor, who after an indifferent first half, rose to the occasion superbly with his relentless running. His 65th-minute punched goal, getting between O'Shea and Ryan to steer home Paddy Durcan's undercooked point attempt, lifted Mayo 2-11 to 2-8 clear and pointed them to the podium. A couple of long-range points and an important steal on Gavin Crowley when Mayo were a point clear in the 59th minute all carried huge value. Matthew Ruane, Mayo's 'find of the season' bolted through for their first goal on 48 minutes, just as he had done with Tralee, this time linking with Darren Coen before stepping inside Jack Barry. The timing of his run for a fisted first-half point was eye-catching and his partnership with Aidan O'Shea has really blossomed towards the end of the league. James Horan can take credit for elevating Carr, whose purple patch just after the break yielded two points, one from a mark as the gap was cut to one. Kerry looked to have weathered the storm when they got it back out to four again but Ruane's goal on 48 minutes was uplifting and the Mayo support in the 44,257 sensed a kill. So too, it seems, did the Kerry players, whose error count spiralled. 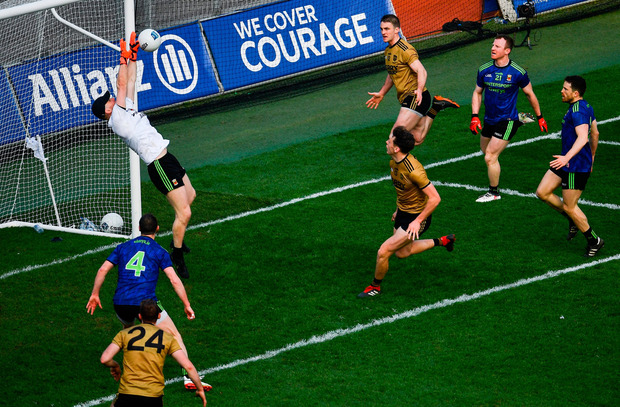 Sean O'Shea briefly stemmed the tide from a free but Mayo surged again with those two O'Connor points either side of a Jason Doherty free pushing them ahead for the first time since Ruane's point gave them a 0-3 to 0-1 lead in the 12th minute. O'Connor's goal had Kerry on the ropes; Ciaran Tracey's 73rd-minute goal, after Andy Moran put him away, counted them out after they had closed to within a point again. Mayo had a scare themselves when goalkeeper Rob Hennelly batted away a punch effort from Clifford and substitute Colm Boyle tidied up. They won't see it as a cathartic moment in their enduring quest for an All-Ireland title but for now it's an achievement in its own right that wraps up a progressive league. Scorers - Mayo: D O'Connor 1-2, M Ruane 1-1, C Treacy 1-0, J Carr (1m), F Boland, J Doherty (1f) 0-2 each, P Durcan, D Coen 0-1 each. Kerry: S O'Shea 0-5 (5fs), G Crowley 1-1, S O'Brien 1-0, D Clifford 0-2, J Barry, P Geaney 0-1 each. Mayo - R Hennelly 7; K Higgins 7, C Barrett 8, B Harrison 7; P Durcan 7, L Keegan 7, D Vaughan 6; M Ruane 8, A O'Shea 8; D O'Connor 9, J Doherty 6, F Boland 7; K McLoughlin 6, D Coen 6, J Carr 7. Subs: A Moran 7 for Coen (50), C Boyle 7 for Vaughan (58), E Regan for Carr (61), C Treacy for Doherty (67). Kerry: S Ryan 8; P Crowley 7, J Sherwood 5, T O'Sullivan 7; G Crowley 6, P Murphy 8, G O'Sullivan 6; J Barry 7, D O'Connor 6; D Moynihan 5, S O'Shea 6, S O'Brien 8; D Clifford 7, T Walsh 6, K McCarthy 5. Subs: B O Beaglaoich for McCarthy (9-11 blood), J O'Donoghue 6 for Moynihan (h-t), J Foley 6 for Sherwood (39), M Griffin 5 for McCarthy (41), P Geaney 6 for Walsh (53), G O'Brien for G Crowley (66).